Kazunoko is the eggs of pacific herring (Clupea pallasii) preserved in salt. It is often dipped in soy sauce and eaten as sushi. 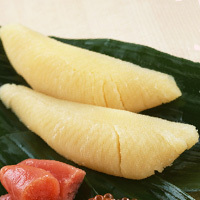 However, most notably it is eaten through the Japanese New Year. Other forms of Kazunoko are that pickled in wasabi and Matsumae-zuke type dishes. It is high in protein, low in fat, and contains almost no carbs. In terms of cholesterol, it is up to par with beef liver, making it a bad choice if you are on a low cholesterol diet. The calories in Kazunoko per 10g(1piece) is 9 calories. Kazunoko is calculated to be 89Cal per 100 grams making 80Cal equivalent to 89.89g with 1.5g of mostly protein、0.3g of fat、0.06g of carbohydrates in 10g while being rich in vitamins and minerals such as Vitamin D and Vitamin B12.